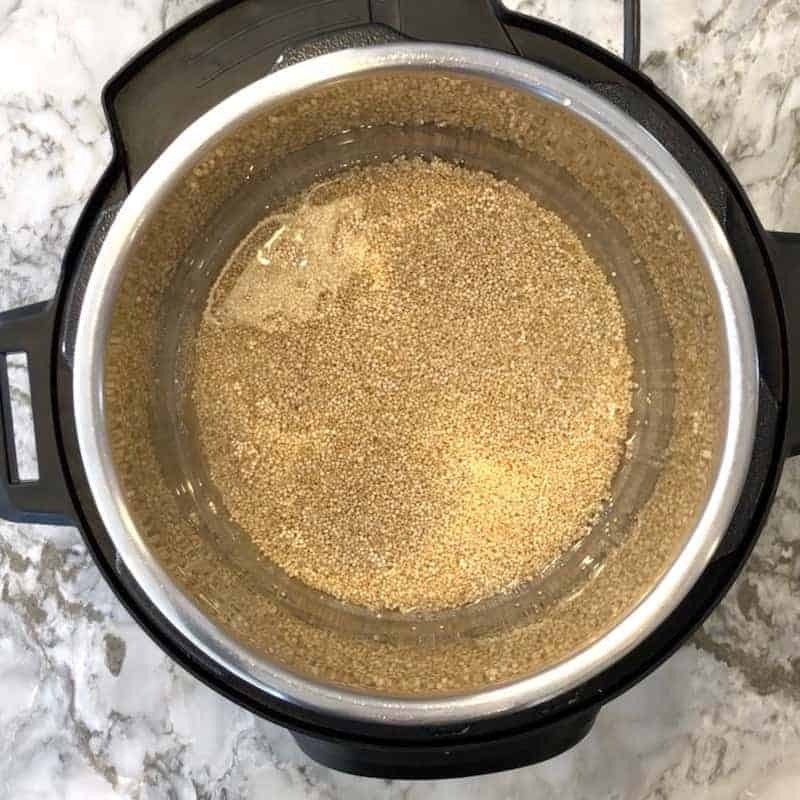 Instant Pot Quinoa, is one of my favorite and go-to basic recipes. 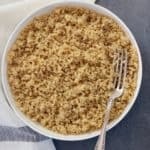 With a few basic ingredients and hands-off cooking technique the Instant Pot makes perfectly cooked, fluffy quinoa. I have enjoyed cooking in the Instant Pot for the last few years. As much as I love making one pot meals, dump and go desserts and creamy breakfast dishes, I use my Instant Pot for a lot of meal preps too. One of them is cooking the perfect Instant Pot Quinoa. 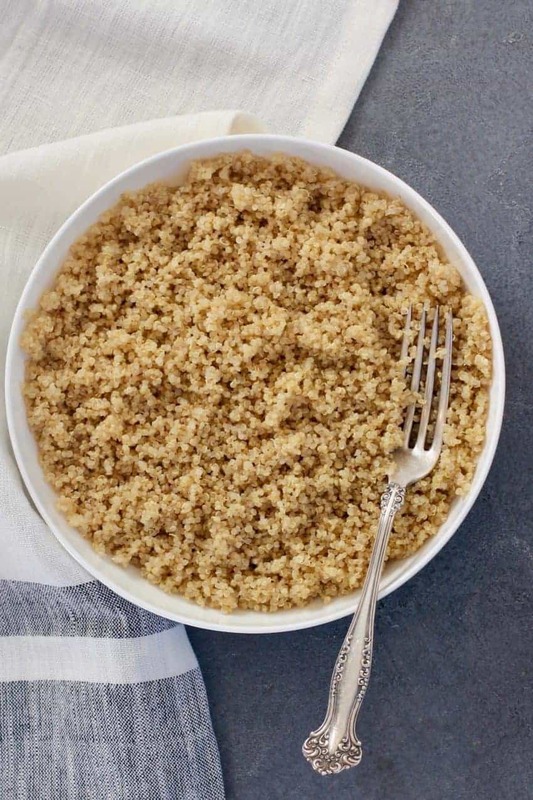 Quinoa is a gluten-free, nutrient-rich seed that is a whole grain carbohydrate and whole protein. 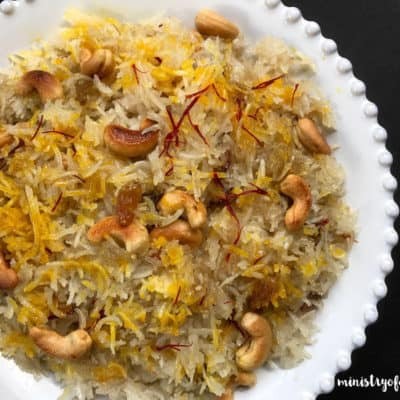 It is considered a super food that not only makes a great low-carb rice substitute but can also be used in making salads, shakes and desserts. Quinoa is commonly sold in three colors – white/ivory, red and black. White quinoa has a fluffy post-cook texture, while red and black quinoa are known to keep more of their shape and color after cooking. Red quinoa has a heartier taste and chewier texture while black quinoa tastes somewhat crunchy and slightly sweeter than either red or white. 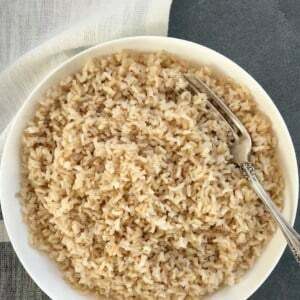 White quinoa can also have a slightly muted, bitter taste. Pro Tip – Rinse the quinoa 2 to 3 times and drain well to remove the slight bitter taste. Quinoa cooks relatively fast using the traditional stove top method. So time-wise you are probably not saving much when cooking quinoa in the Instant Pot. 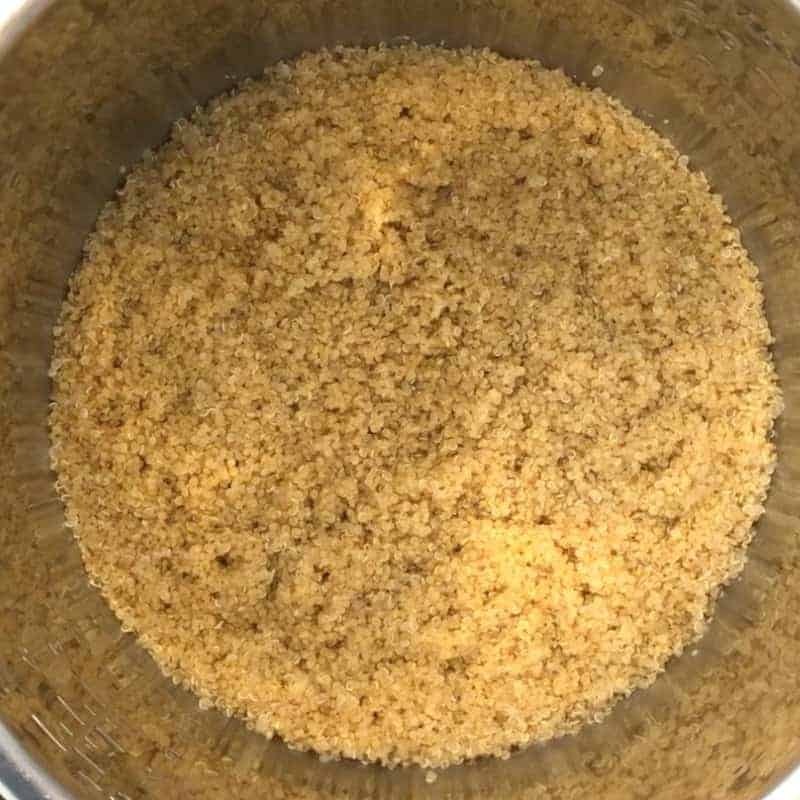 The advantage of cooking quinoa in the Instant Pot is that you will get consistent results with hands-off cooking technique. 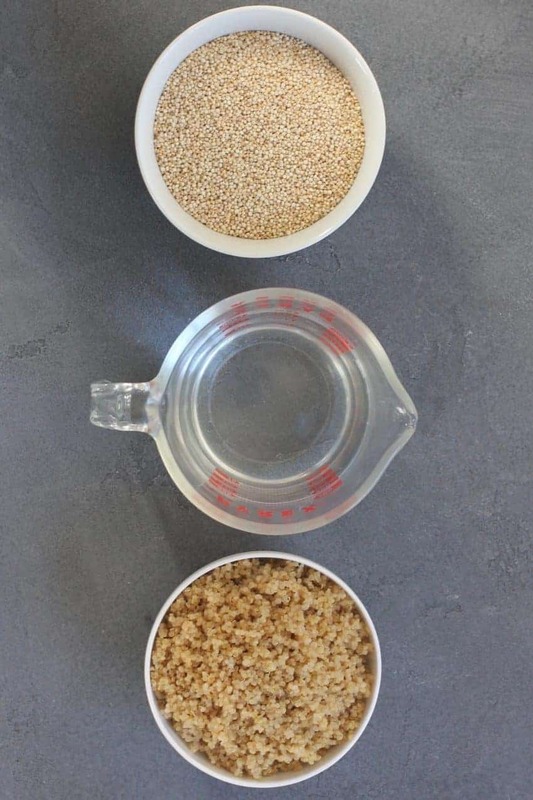 Depending on the amount of quinoa you want to cook, you can use the main-pot or pot-in-pot method to cook quinoa. Add rinsed and drained quinoa to the pot, set the pressure cooking time and walk away. There is no need to watch over or turn off the heat. Rinse 1 cup of quinoa 2 to 3 times under running water. Drain well and add to a stainless steel bowl along with 1 cup of water. Add 1 cup of water to the main Instant Pot insert. 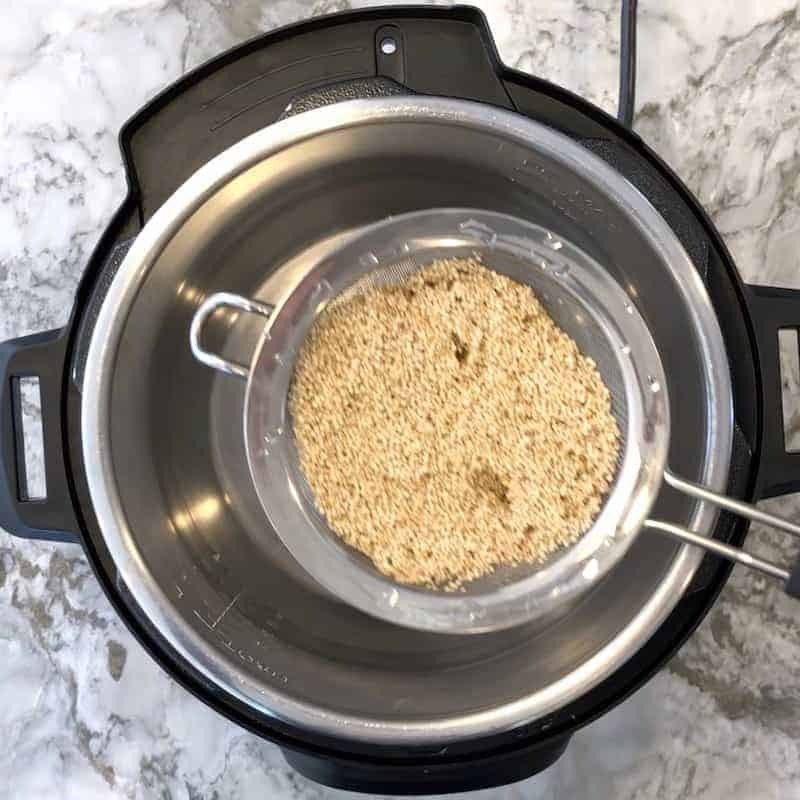 Place the stainless steel bowl with quinoa on the trivet and then carefully place the trivet in the Instant Pot. Close the Instant Pot lid with pressure release handle to sealing. Set the Instant Pot to Pressure Cook (Hi) for 4 minutes. Allow 10 minutes of natural pressure release. Release any remaining pressure by moving the pressure release handle to venting and open the Instant Pot. Take the inner stainless pot and the trivet out using heat resistant mitts. Gently fluff the quinoa with a fork or silicone spatula. Place quinoa in a wire mesh strianer and rinse 2 to 3 times, massaging it gently. Drain the quinoa. 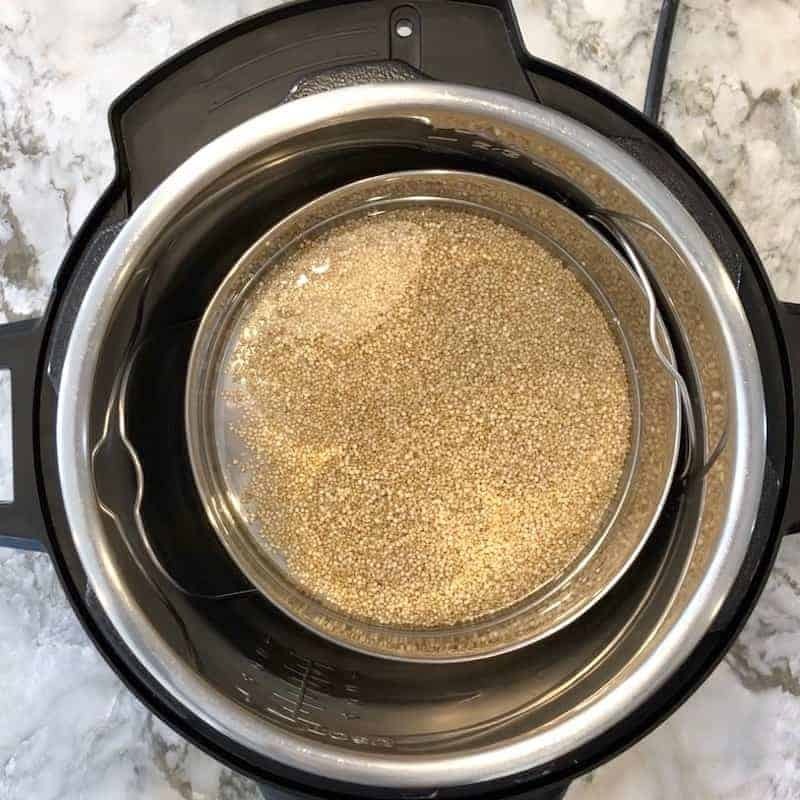 Add drained quinoa to the Instant Pot insert. Add water and make sure all the quinoa is evenly submerged under water. Close the Instant Pot lid with pressure release handle to sealing. Set the Instant Pot to Pressure Cook (Hi) for 1 minute. Allow 10 minutes of natural pressure release. Release any remaining pressure by moving the pressure release handle to venting and open the Instant Pot. Gently fluff the quinoa with a fork or silicone spatula. 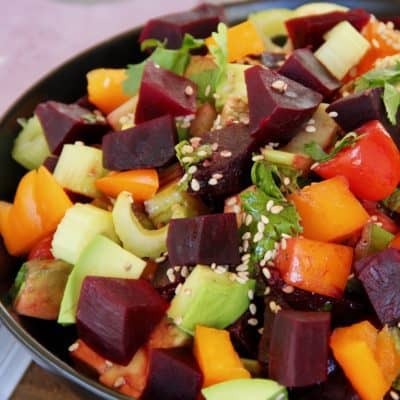 Looking for a healthy and delicious recipe using cooked quinoa? Try these Quinoa almond date truffles! 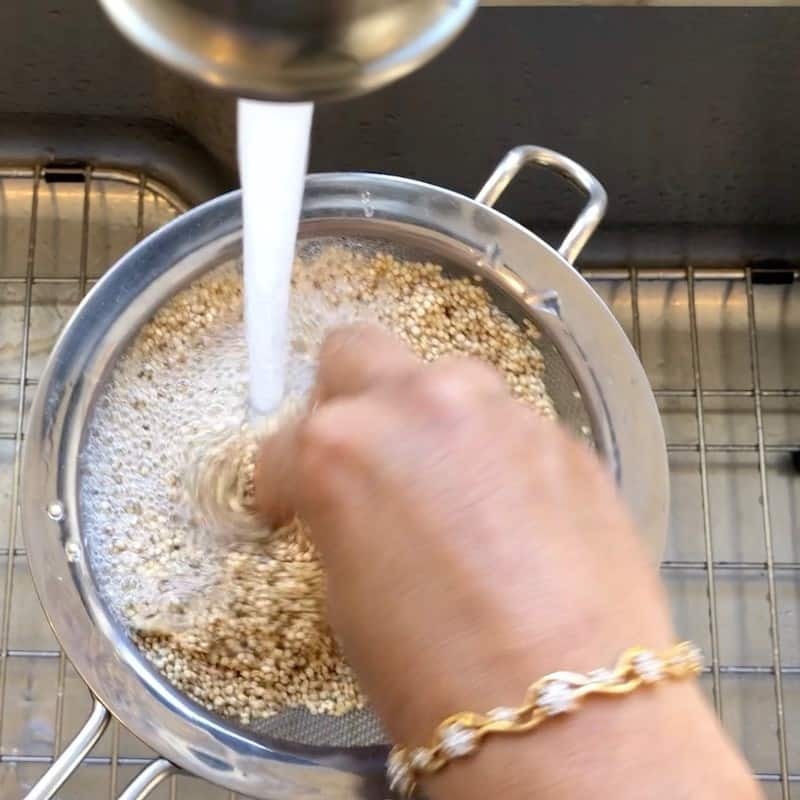 Place quinoa in a wire mesh strianer and rinse 2 to 3 times, massaging it gently to reomve the outer covering of saponin. Drain the quinoa. 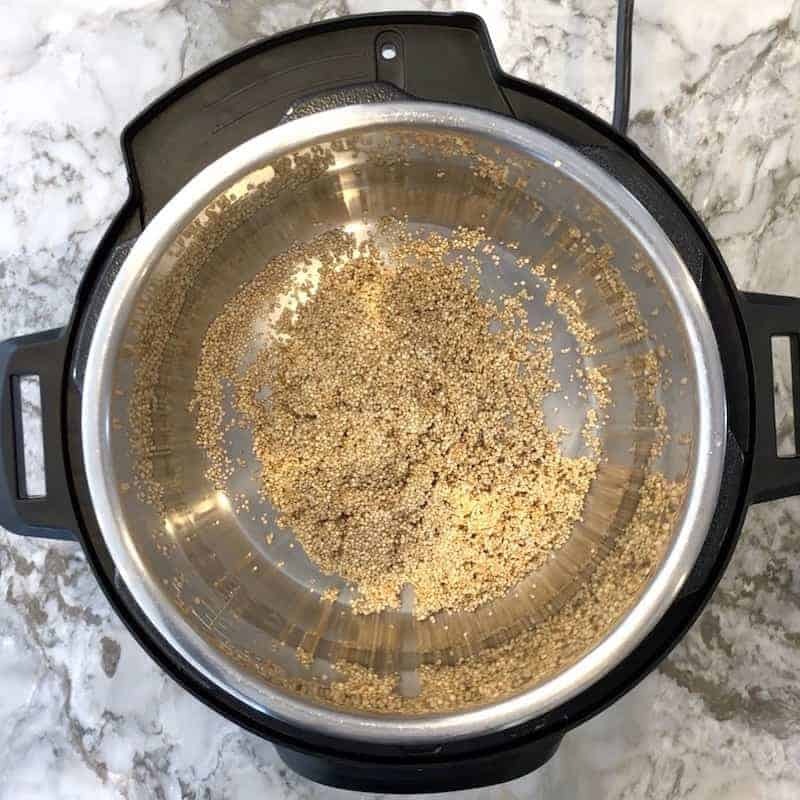 Add drained quinoa to the Instant Pot insert. Add water and make sure all the quinoa is evenly submerged under water. Close the Instant Pot lid with pressure release handle to sealing. Set the Instant Pot to Pressure Cook (Hi) for 1 minute. Allow 10 minutes of natural pressure release. Release any remaining pressure by moving the pressure release handle to venting and open the Instant Pot. Gently fluff the quinoa with a fork or silicone spatula. Add 1 cup of water to the main pot. Add drained quinoa and water to a stainless steel pot and place the pot over the trivet. Carefully place the trivet inside the main pot. Set the Instant Pot to Pressure Cook (Hi) for 4 minutes. Allow 10 minutes of natural pressure release. Release any remaining pressure by moving the pressure release handle to venting and open the Instant Pot. Take the inner stainless pot and the trivet out using heat resistant mitts. Gently fluff the quinoa with a fork or silicone spatula. If you are planning to use the quinoa in savory dishes or salads, add a pinch of salt while cooking. You can also use broth instead of water for added flavor. 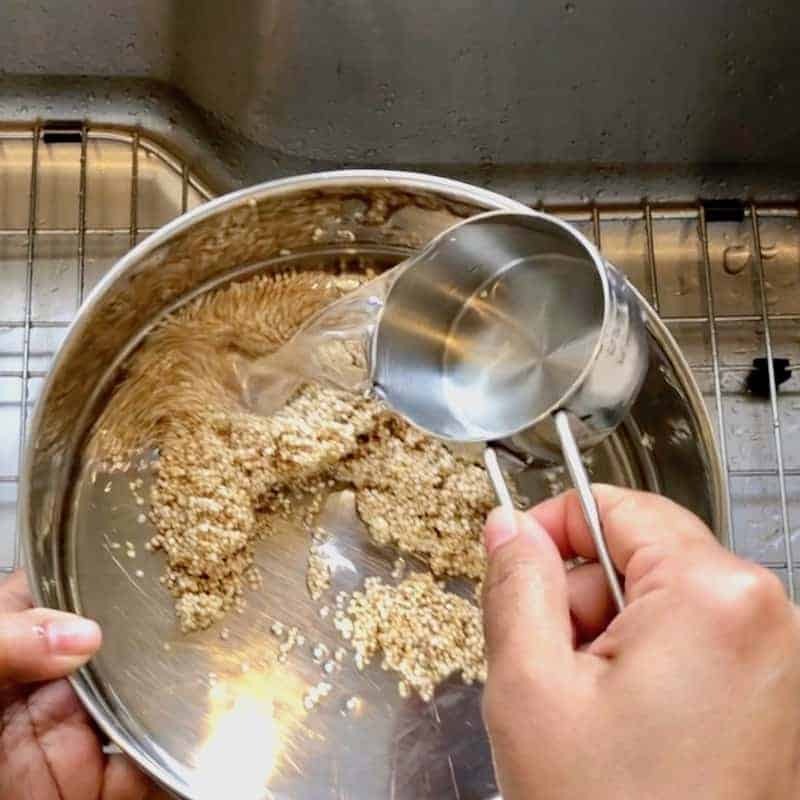 If you are making lesser than 1 cup of quinoa, it is best to use the pot in pot method. 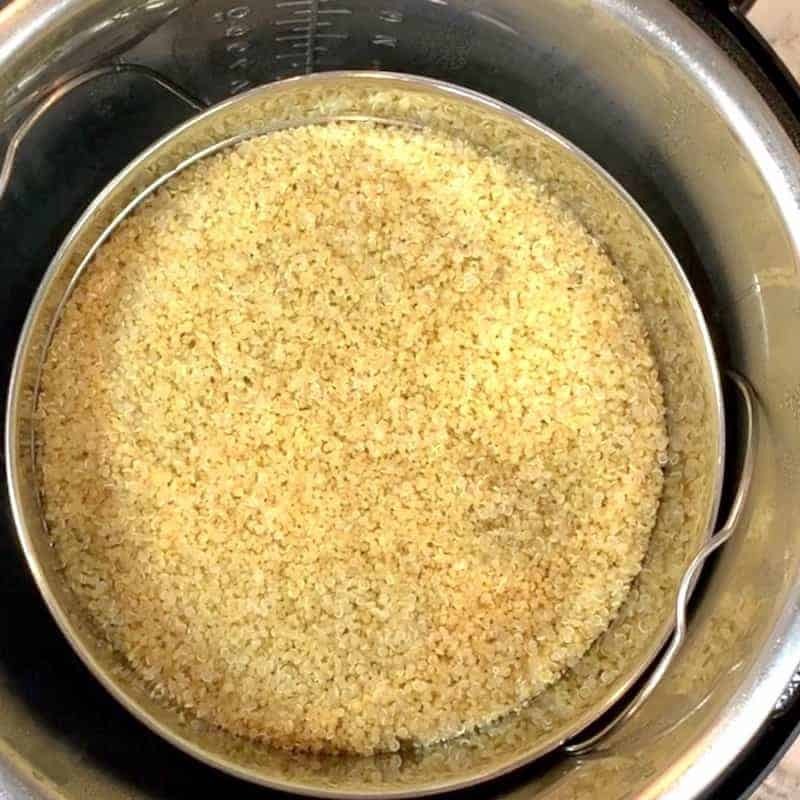 When cooking quinoa directly in the main pot, you can also spray the bottom on the Instant Pot insert with oil. This prevents the cooked quinoa from sticking to the bottom of the pot. Please , please check for me. I am getting NONE of your posts. I love your site. My sister sends them to me. My name is Theresa Hammond , email , ng.theresa48@gmail.com. I re subscribed and refused as I already have subscribed. Don’t know what to do. HELP , Theresa. I am so sorry. I will add you again. But do check your spam folder, just in case. And thank you for the kind words. 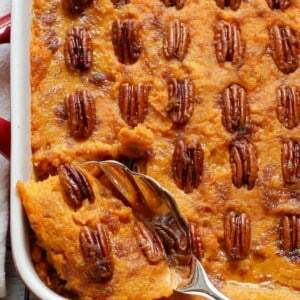 If its ok I will also add you to my bi monthly newsletter for more recipe inspiration. Yes! Will work with the pot in pot recipe for quinoa. Just stack rice and quinoa.